Hospitals across the UK are losing millions of pounds simply by not providing a payment facility for patients to pay for their prescriptions. Specifically during out of hours patients nationally are able to get access to their medication without paying for it simply because the hospital do not have the facility to enable them to take payments either by card or cash. Barnet and Chase Farm Hospitals (now part of the Royal Free London NHS foundation) approached Cammax to help find a solution to their problem. The pharmacy department in the Hospital was struggling to cope with demand, and finding it difficult to collect cash for prescriptions as well as issue medications. 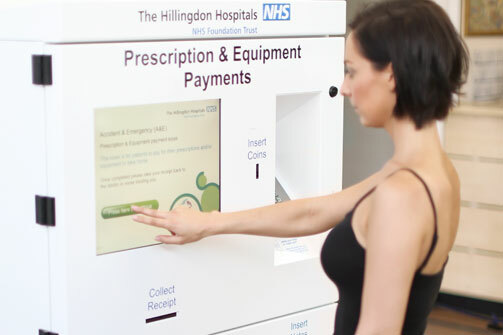 Therefore the hospital wanted to introduce a simple to use self-serve machine with an engaging front screen flow which could take payments for prescriptions and issue a receipt, which the patient could then take to the pharmacy to collect their prescription. The pharmacy could then concentrate on issuing medicines and leave cash collection to the kiosk. The kiosk needed to take cash and debit and credit cards, and be able to issue change. The change carrying capacity of the machine needed to be large, as it was very important that the machine didn’t run out of change or receipt paper during busy periods. Cammax met the change requirement by developing a machine with large, extremely robust change carrying hoppers, and also using a printer which could carry a large receipt roll. In addition, Cammax developers created a secure real time on line audit system, which reports all sales on the kiosk in real time. The advantage of a real time audit trail is that alerts can be set up and monitored by the customer. For example, if the receipt paper is low, an e-mail is sent to the necessary person to come and install a new roll of receipt paper. Cash takings in the machine are also monitored automatically, so that takings cash (usually notes) can be removed and more change added as necessary. A recent report suggested that there are some individuals who use A&E like a type of enhanced GP service as some NHS Hospitals don’t change for Prescriptions. The presence of a very visible “Prescription Payment Kiosk” alerts such individuals that if they want a prescription they will need to pay for it at the machine. “The kiosks where installed as a way to capture lost revenue which Barnet and Chase Farm A&E were missing as a result of having no facility to take payment for prescriptions costs outside the opening hours of the hospital pharmacy. The revenue generated by the kiosk quickly paid back the initial capital costs of the kiosks and now provides an ongoing revenue for the department. So far the kiosks have taken approximately £50,000 in missed revenue. Barnet and Chase Farm A&E have found that throughput has speeded up since the machines have been installed, and also that the pharmacy has been able to cope much better now they are not also handling cash. In addition, the A&E department now collects approximately £2000 each month, which is important in these times of austerity! As a result of this Chase Farm have gone on to order additional kiosks for other departments and other hospitals have adapted the concept to create a complete cash payment solutions developed specifically for the NHS which allows A&E and other departments to take payments for a wider range of services such as prescriptions, ultrasounds, walking aids, tens machines and other items. A group of seven prescription payment kiosks installed in London A&E departments have collectively taken £275,000 of additional revenue since installation in 2012. This capturing of lost revenue enables the kiosks to be purchased by hospitals at very low risk due to the high returns seen almost instantly.